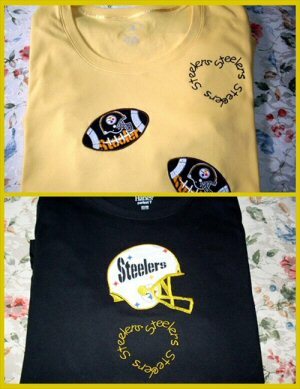 Here you will find projects other people ( or myself ) made with my designs. How cool and 'summery' does this look? thanks Tammy for showing. 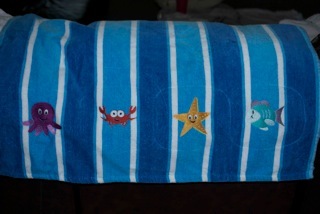 A beautiful burp cloth made by sewforfun. 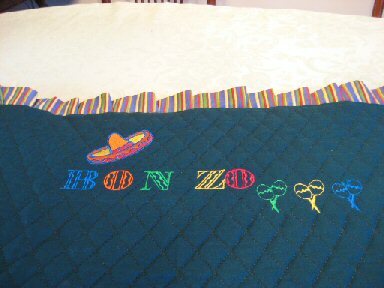 mommar has made a nice mexican style bedcover. 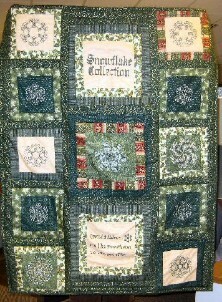 Loralyns 'quilt. Isn't this Beautiful!!? 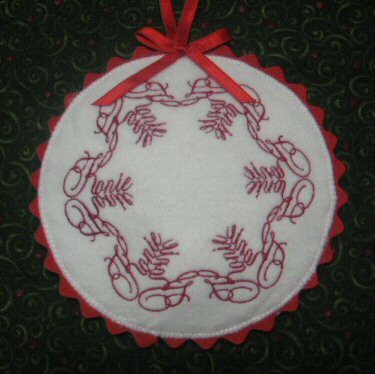 This wonderful napkin is made by Lovellenaz. 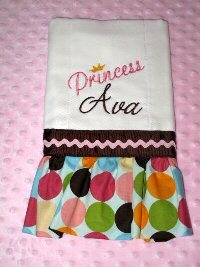 Leemckenny made this blanket and burpcloth. Doesn't it look great together? 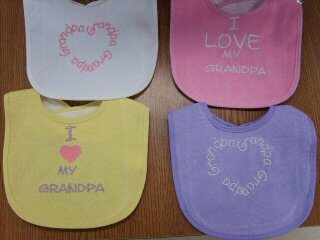 Look at those cute bibs from kdgteacher! 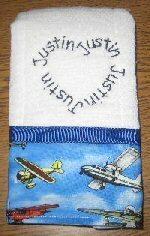 Huskymom made this burpcloth with a heartname! It came out really nice. 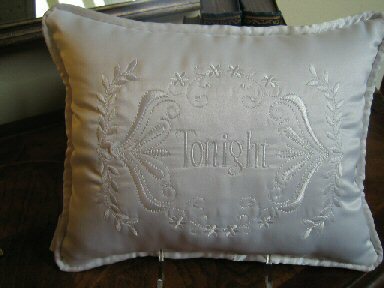 Heck9000 used the Twilight Font to make this beautiful pillow. Some more heartnames from lovellenaz. 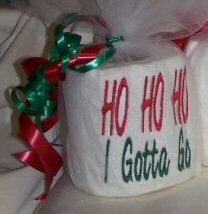 Toiletpaper by Goosepoint, what a nice gift! I designed the text and Crestedlady made this lovely wallhanging. 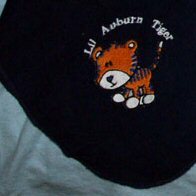 How cute looks this little Tiger, thanks to Cgillen. 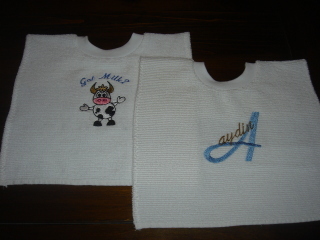 CCB also used the App.Anchor, but for a bib and burpcloth. Looks lovely! Niener made this beautiful outfit with the App Anchor. thegreat1micini made this name, using the Bat as an M. Really creative! 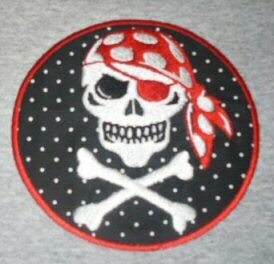 Fayep made this great patch !!! 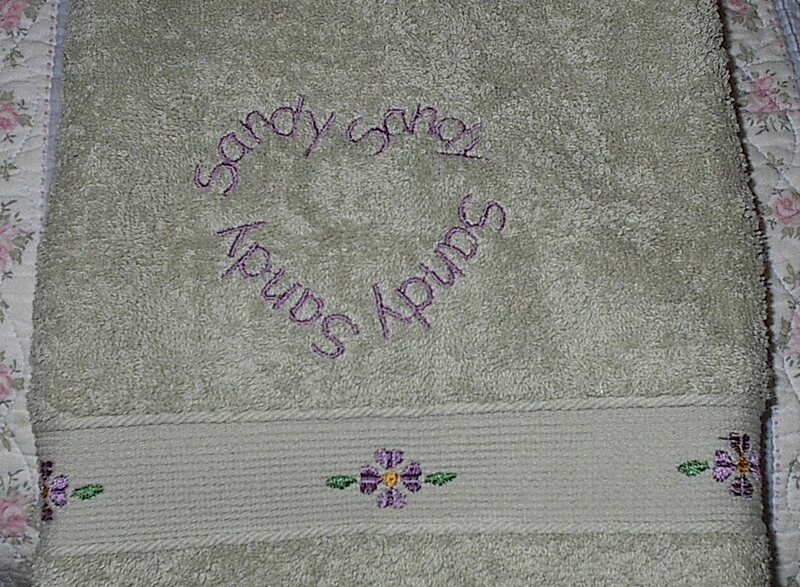 Purselady created this beautiful towel with one of the heartnames. 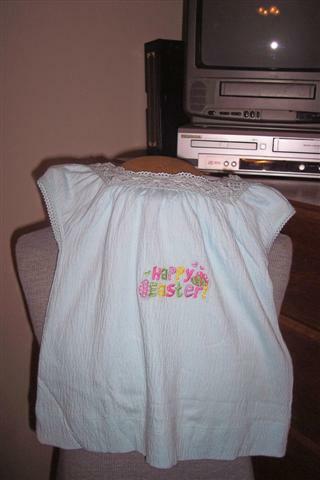 Christie made a nice sheet for a newborn. 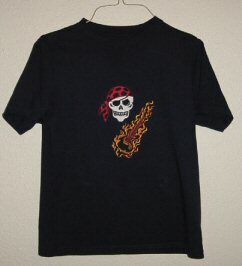 And Twinkle made a really cool shirt with my skull design. I bet every teenager wants one! 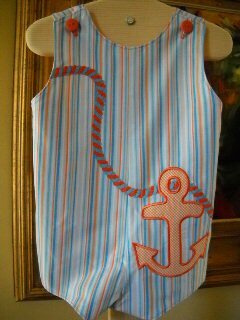 lovemycatkellar made this nice anchor applique! Looks great for a reunion.Thank you for showing Becky Larson. 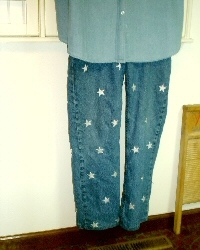 SuzanneR embellished her jeans with loads of stars!! 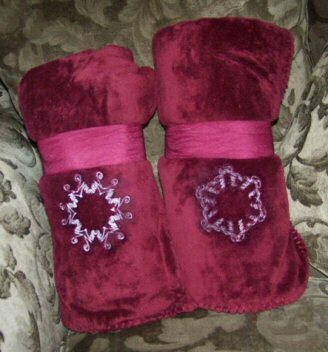 you can find them in 'other designs' on this site. 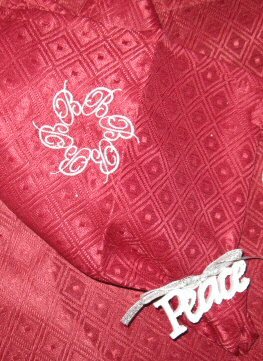 And look at this super cute pillowcover Rose48458 has made. you can find the maze in 'other designs'. Boma is already prepared for the Easterhunt!! The top looks really nice!! Here you see the cow I've made. Pinon made a cute bib !!! 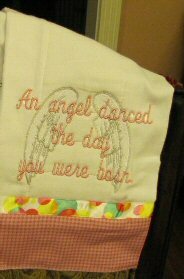 Sheehancreations (Barbara) made these great and funny pillows with the retirementQuotes. 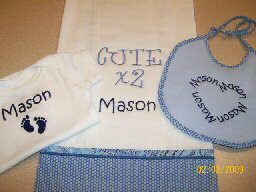 Which you can find in the ' other designs' section. 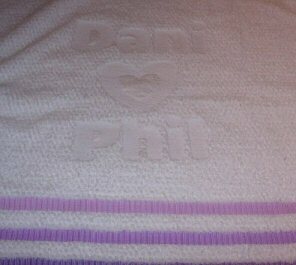 Nece made these 2 nice blankets with my heartnames. Don't they look cute? 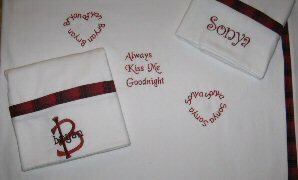 This shirt is made by Desinghog. It looks lovely, and the colours are great too! 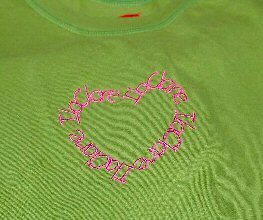 Grandmasieg made this beautiful shirt for her daughter. 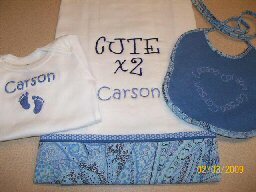 Grandmasieg also made these BEAUTIFUL shirts and bag. She is definately ready for the Super Bowl now! Doty 's made this tshirt for her daughter. She used a 'heartname'. Doesn't it look great?!! 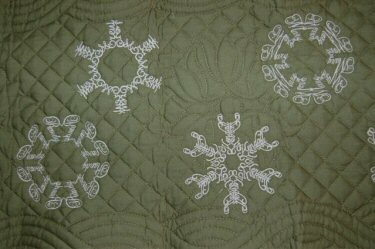 Look what fun2sew made from a snowflake name!! isn't this the cutest ornament?? Aren't those throws beautiful. Made by novmomof3. She has used my names and the snowflake names of Bjbert. And look at this fabulous tablerunner from Peditriage? She used my snowflake names and also the ones from Bjbert.